AdLuge helps smart businesses measure all their online marketing efforts. AdLuge is TechWyse Internet Marketing’s proprietary measurement and lead management tool. Over the years, we have developed this tool from the ground up to meet the needs of our clients. AdLuge is the one place you can go to understand all of your inbound marketing performance. Need to understand where your leads are coming from? We’ve got you covered! AdLuge offers Source, Medium, and Campaign tracking across virtually any online effort. AdLuge offers an intuitive lead management system designed to help sales staff follow up and effectively manage their leads through the sales cycle. AdLuge also provides executive level Search Engine Ranking reports for not only your business, but your competitors as well! Measure your website performance Analytics from top to bottom, all in one location, to help see what efforts are bringing the greatest ROI. Implement actionable, data-driven improvements to both your online and traditional marketing campaigns based on proven results obtained from AdLuge! CLIENT TESTIMONIALS Our clients love AdLuge! "Having all my lead activity, online performance reports in one place allows our company to understand where our leads are coming from and in turn, which campaigns are working. All of my staff uses the lead management tool to follow contacts through the sales process. AdLuge automates everything!" "As a company that receives a high volume of leads, I needed a system that would help show me where my leads were coming from and to follow through the sales cycle. AdLuge is a dream to work with, and the staff are always there to support me." You can learn more about AdLuge by visiting the website! Why do I need AdLuge? 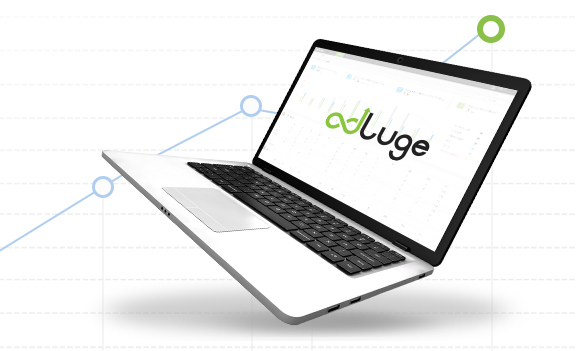 AdLuge doesn’t just help you understand your website’s performance, it also helps you review and organize your leads. You can assign leads to specific people within your organization. The best part of AdLuge is being able to chart your progress using everything from Google Analytics data to keyword ranking reports. Is there training for AdLuge? Definitely! AdLuge is an amazing wealth of information, but there is a learning curve that comes along with using it for the first time. Your dedicated account manager will be able to show you how it works, which metrics are most important to your brand, and how to use it to your advantage. What type of metrics/information will I see in AdLuge? AdLuge allows you to see where your leads are coming from across multiple mediums all in one place. Social remarketing, PPC campaigns, organic traffic. You can see which areas get you the most attention so you know where to invest your money in. Unlike other metrics tools, it allows you to measure and compare your search engine rankings against your competitors! How is AdLuge different from Google Analytics? AdLuge is more advanced than Google Analytics in many ways. It allows you to manage leads in a CRM, it allows you access to call tracking, and has the functionality to show you metrics from all of your lead areas (social, organic, paid and others) all in one place!